Region: This bug is found in the eastern United States with similar species in the west and in Canada. Life cycle: This insect produces one generation each year and can hibernates as an adult or egg. 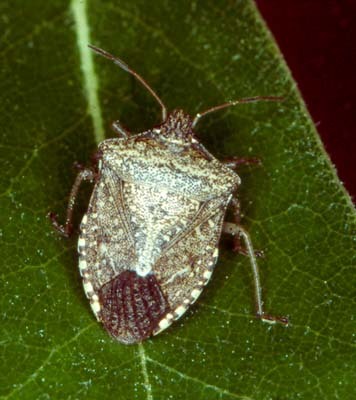 Physical Description: This Stink Bug is brown with a checked border beneath its wing covers, is 1/2 inch long, and shaped similar to a shield. It lays its eggs on leaves and fruit. Feeding characteristics: This pest damages blackberry, cabbage, corn, peach and tomato plants, when the adults and nymphs puncture the fruit skins, causing a gummy substance to appear. The injured fruit will appear pitted. Many similar stink bugs are predaceous. Controls: The most effective preventive maintenance is weed control. The pests are also vulnerable to soap sprays for serious infestations dust with sabadilla.